We asked kids what really cool things do they like to do that they have never done or perhaps enjoyed at an overnight camp (and threw in our own ideas of course). We then went through the list and said okay now which of these really cool things can we do safely with 40 Middle Schoolers... and not driving to Canada. Our field Trips are designed around the fact that we want everyone safe so we can have a blast. THE BUS: When picking transportation I wanted the safest camp ride possible, and that lead to buying a 66 passanger Blue Bird School bus. It is certified by the DOT and Bright From the Start Licensing. BTW we made sure to add a brand new Air conditioning unit! The Bus Load: We have precious cargo. We will have only 40 campers per session and all our counselors ride with us. We drive safely ALWAYS! The Bus Driver:- Ms. Lara has her CDL, she has driven a bus at a previous camp and is happy to show you her driving record.. its stellar! We will also hire a school bus driver that drives for our school system to have when needed. Counselor to Camper Ratio: 1 to 10.... Our counselors are CPR/First Aid Certified and are experienced with kids and go through an intense Kiddos training. On all field Trips students will be briefed on the how to be safe. Counselors will have specific groups the are responsible for and we will always have first aid kits, water and emergency medication. All field trips are 1 hour and 15 minutes or closer. On each field trip we know our closest hospital. Below are some trips that require extra special care and plans! Orienteering/Hiking- Hiking only Georgia State Park Mountains and have worked with Park rangers to map out trails, safety plans and meeting points. Kids are always with a counselor. All trails have been hiked prior to bringing campers! We have identified small and shallow streams along several paths, to cool off. We will not get in any water that is above mid calf and tested by Miss Lara or Mr. Troy. Horseback Riding: We are going to be around and then ride on top of a large animal. We are going to a Stable and riding ring that has over 20 years experience with children's riding lessons and trail rides. Riding horses will always have risk involved. However we will strictly follow all safety precautions including supervision, helmets, approach, etc. Zip-Lining: All zip lining is onsite of licensed and insured Zip-lining and ropes Course properties. We go through guided zip lines with professionals leading the way, and Kiddos Counselors keeping eye on our campers safety. Pool: All pools are public city pools that have life guards in addition to our alert counselors. We will need to know if your camper can swim at registration and will have swim test when we first get to the pool. (As well as special guest showing CPR/life guarding drills) Students who can not swim or are not strong swimmers will be noted and must stay in shallow water with a specific counselors assigned to make sure they stay there. Nature: Yes we are taking your city kiddo into the outdoors. They will be dirty, have occasional bug bite or see a snake. 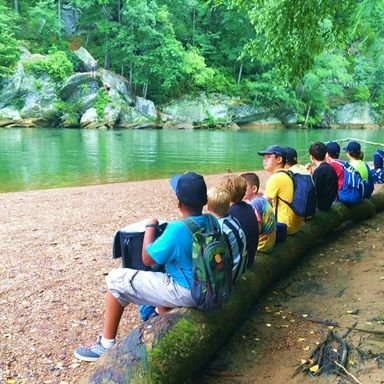 We cannot make the bugs, bees, reptile, mammals, plants adhere to our safety rules but we PROMISE to give your campers and our counselors the tools to deal with each adventure and "nature" incident as it comes. From outdoor first aid kits to the proper way to dress to avoid bug bites. Our goal is to get your kiddo back home dirty and healthy each day! Asthma: Parents are responsible for being VERY detailed about campers asthma and inhaler instructions. We will work out a plan for each camper to make sure asthma doesn't hold them back at adventure Camp! Allergies: Parents are responsible for being VERY detailed about campers allergies and Epipen or Benadryl instructions. We will work out a plan for each camper to make sure allergies don't interfere with the trip. Illness: If a student gets sick, even if while on a field trip and the parents need to come get their camper, parents will be responsible for coming to our location. Medical Emergency: In the case of emergency, 911 will be called and campers will be transported by ambulance to a Hospital. When possible we will send our campers to Atlanta Children's Hospital. We also will know where closest hospital is from each field trips. Kiddos only administers Emergency Medication such as an Epi Pen/ Inhaler. Parents must provide inhalers/ Epi pens for known medical conditions. There is a medical form that must be filled out and turned in for any medications that must be giving and must include any possible adverse reactions and instructions on when and how to administer it. Student Behavior: We have so much great stuff to do we don't anticipate any "non-listening" issues. All students must behave in accordance with our safety rules. If we feel students are putting themselves or any other camper in danger they will not be able to return to camp and parents will not be refunded. Electronics: Students may NOT have cell phones or ANY electronic on their person during an adventure. Yes they will survive and you will be able to contact your children in an emergency. ALL counselors will have fully charged cell phones. We will allow students to bring electronics for use if they are in Before Camp or After Camp. If there is an emergency and a message needs to be transmitted to our adventure camper please call me. (This made it under safety cause we know this is everyone's, including parents, emotional security blanket).